WordPress, today, has proudly surpassed an approximate of 33% worldwide market share on the internet. This means more than 33% of websites are powered by this well-acknowledged platform. Needless to say, other content management systems are not even closer to where WordPress is standing today. Do you need help in starting your WordPress site? Why should you buy a paid WordPress Theme when you have free? Having said that WordPress is an extremely popular platform would be a sufficed statement. And, one of the primary reasons behind its popularity is the significant number of plugins available for users. Right from customization to optimization, these plugins can help achieve almost every task. Literally, one can find thousands of plugins out there. While some are universal when it comes to usage, others are created for specific tasks. If you couldn’t find out the best ones for yourself yet, this post will make you familiar with some of the amazing premium WordPress plugins from WpEka that you won’t be able to ignore. When you take your business to the online market, there are specific rules and regulations that you would have to follow. Primarily, as a business owner, it becomes your responsibility to notify your users or customers regarding every action that your website takes, be it collecting their data or using it for certain things. In such a scenario, the WPLegalPages plugin can help you to come up with niche-specific legal pages. This plugin comes with inbuilt page templates, which can be edited, to make them appropriate enough with your business. Not just that, but these templates have been curated by keeping the internet laws and rules in mind. Hence, you can always keep your business safe from unforeseen legal troubles. To take better business decisions and to make a good amount of revenue, it’s quite important to understand your customers and website visitors. Without having an idea of what they expect, making the business thrive can become difficult. Hence, SurveyFunnel can be your sure shot bet when it comes to keeping user engagement high and converting them for good. Along with helping you create mesmerizing surveys and questionnaires, this plugin also offers to analyze feature to figure out how your visitors are reacting to your site and brand. Moreover, it also comes with advanced features, like conditional logic, MailChimp integration, and more to make the best use of visitors’ recorded data. Another one on the list is this automated directory generating plugin. WPLocalPlus can be a helpful tool if you wish to bring all the businesses and customers together in one place. You can generate a variety of listings for different niches. And then, by adding valuable information to these listings; such as the latest deal, offers, and discounts, you can help businesses get more exposure. In this way, you can even let customers save a few bucks on products or services that they will purchase. This plugin also allows you to generate more revenue from a directory website by displaying a variety of Ads on different pages. Out of all the elements that can enhance the entire outlook of the website, images are always kept at the top of the list. Keeping this in mind, CollageMaker is an adequate premium plugin that lets you create engaging and striking collages for visitors. With a variety of layouts, you can always experiment with how your images are going to look like. And then, this plugin also offers the flexibility of adding these collages anywhere on the website, be it a post, page, or any other place. Along with the potential to export images from external sources, you can also edit and customize them according to your requirements. One of the best ways to keep visitors engaged is by providing them with something to hold onto. Although the list of such tasks would be quite long, however, even if you’re organizing raffles and contests on the site, it would be enough. If that’s what you’re thinking to do, this plugin will definitely come handy. 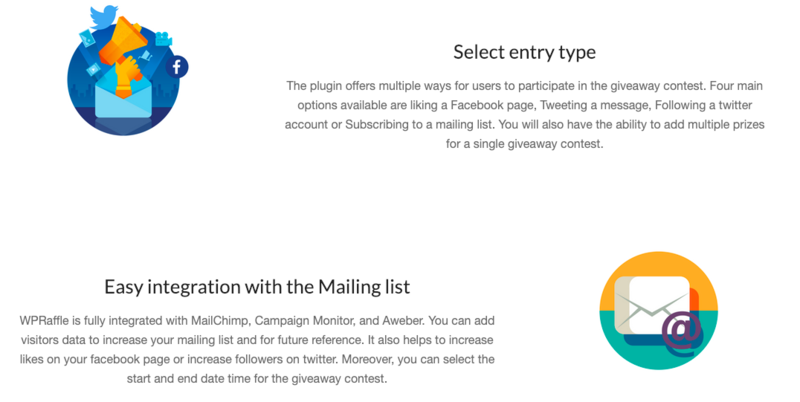 Whenever you organize contests and raffle draws, this plugin gives you different entry types to select from. Hence, with every contest, you can bring something different for users. Additional features include integration with a mailing list, quick registration process, automatic or manual selection of winners, social share and more. With every possible business making its way online, auctions aren’t left behind. Thus, if you wish to begin an auction website, this plugin will help you carry out this task efficiently. With features like eBay style auctioning and penny auctions, intriguing visitors won’t be difficult. Moreover, you can also integrate PayPal and Authorize .net for transactions purposes. This plugin lets you send automatic invoices to customers who’d buy items from your online. Hence, selling and buying will be an easy process for both parties. If you wish to maximize visibility on certain items, you can also list them on the homepage and generate easy views. If you’re one of those who display and manage advertisements on the website, you’d surely need this plugin to help you at every step. WP AdCenter is an advanced Ads manager plugin that not just lets you showcase a variety of advertisements but use them for your own good as well. Along with adding unlimited Ad zones and campaigns on the website, you can also get your hands on relevant statistics to understand more about impressions and clicks that your Ads are obtaining. In this way, you can tweak and edit them whenever necessary. With this plugin, you can provide advertisers with a chance to buy advertising right on your website. All you’d have to do is create a package, drop a shortcode into the page, and the plugin will generate a signup form for buyers. With an incredible increase in online shopping, customers leave no stone unturned when it comes to verifying the credibility or seeking answers to their questions. Hence, to help them with this, you can take a step and create a questionnaire website. If you’re ready, you can make the best use of this plugin. By letting you create questionnaire listings, this plugin can help you come up with your own forum similar to Quora, Yahoo Answers, and more. With WP-Answers, you can allow users to ask questions in different forms. Further, it has an extensive list of features, including reward points for best answers, spam moderation tools, email notifications, upvotes and downvotes, and much more. When it comes to ranking the website higher on search engines and gaining more traffic, search engine optimization comes to the rescue. But, what if you aren’t a pro at this technique? You wouldn’t go on spending a huge amount of money on someone who can do this task for you, right? By purchasing SEOBreeze, all your hassles can be solved instantly. It can help you execute different kinds of SEO, including website, social media, and video. And then, by analyzing all your pages, this plugin ensures that everything works according to the plan. And then, SEOBreeze also makes it easier to integrate your website with different webmaster tools, such as Google, Bing, and more. Last but not the least, just as the name suggests, SlideDeck is a plugin that would let you create mesmerizing sliders on the website. Whether you wish to create a slider through images or videos, this plugin can help you appropriately. Also, it comes with a variety of features that would allow you to give a unique touch to all of your sliders. Right from its lenses to its prebuilt templates, there is a lot that you are going to find in SlideDeck. Out of plugins, if you’re looking for any responsive AdSense ready WordPress theme, this is going to be your reliable source. If you’re familiar with every bit and piece of AdSense, you’d know that Google has some recommendations and guidelines for the placement of Ads. This tool tells you appropriate placements so as to help you gain higher click-through rates (CTR) on your advertisements. In this way, you can get more exposure to the brand as well as revenue through advertisements. This tool also offers a variety of subthemes from where you can choose the relevant ones. And then, automatic Ad hiding, social networking integration, Google custom search engine are some of the other additional features. Another tool that can help you amazingly with AdSense clicks is this Heatmap Theme Pro. Being one of the most considerable SEO-friendly themes, this one can be a perfect selection for AdSense and niche websites. With this theme, you wouldn’t feel the need to get customized coding or installation of any Ad plugin. Specifically designed for high click-through rates, this tool ensures that your content and Ads are getting maximum visibility. 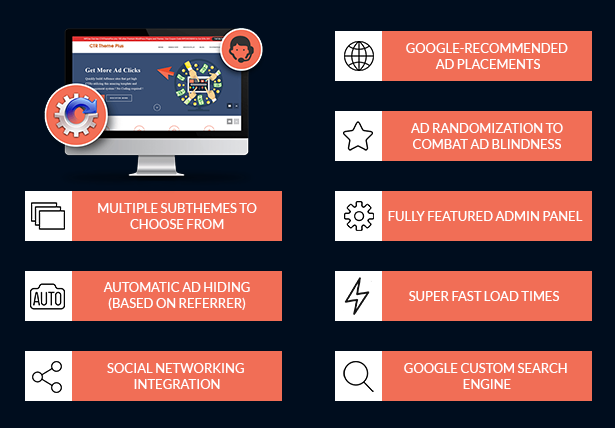 Moreover, it even eliminates Ad blindness and makes sure that visitors are turning around from specific products or services that you wish to highlight. Undoubtedly, finding plugins that can be useful isn’t an easy task, especially if you are putting your money on them. However, without thinking twice, you can consider these amazing WPEka premium WordPress plugins and see what suits your needs the best. The best thing is that you can even buy these WordPress Products in a bundle, at a discounted price. Just register at the site and things will follow suit. Note: This article on WPeka premium plugins for WordPress was contributed by Sanjeev Pandey. If you have an interesting WordPress article to contribute, then check our guest posting guidelines.